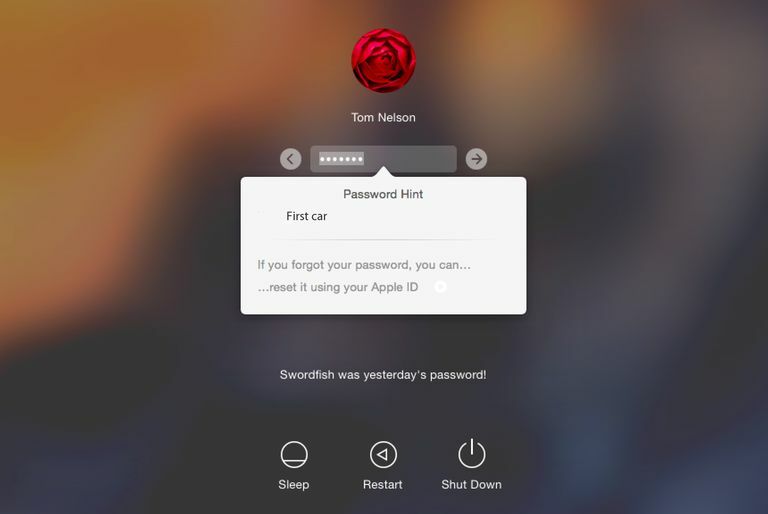 If you can't remember your Mac's administrator account password, you aren't able to log in to your account or perform various tasks that require an administrator password. You can reset a user account password, including any administrator account, using one of the following methods. Make sure the Caps Lock key isn't active when you type in your password. That or any change in capitalization renders your case-sensitive password unacceptable. Resetting an administrator account isn't difficult, as long as you have a second administrator account to use. It's a good idea to have a second administrator account set up for troubleshooting various issues, including forgetting a password. Of course, that only works if you haven't also forgotten the password for the other administrator account. If you don't remember that password either, try one of the other methods outlined below. Log in to a second administrator account. Launch System Preferences, and select the Users & Groups preference pane. Click the lock icon in the bottom left corner of the preference pane and enter your administrator password. In the left-hand pane, select the administrator account whose password needs to be reset. Click the Reset Password button in the right pane. In the screen that drops down, enter a new password for the account, verify it, and provide an optional password hint, if desired. Resetting the password this way creates a new keychain file for the user account. If you want to use the old keychain file, see the instructions below. One of the features introduced with OS X Lion is the ability to use your Apple ID to reset your administrator account on your Mac. You can use this feature to reset the password for any user account type, including a standard account, managed account, or sharing account. To use your Apple ID to reset an account's password, the Apple ID must be associated with that account. You would have associated your Apple ID with your user account either when you initially set up your Mac or when you added user accounts. The Allow user to reset password using Apple ID must be checked in System Preferences > Users & Groups for this method to work. Enter your password incorrectly three times at the login screen. You'll see a message that displays your password hint if you set one up, and the option to reset your password using your Apple ID. Click the small right-facing button next to the …reset it using your Apple ID text. Enter your Apple ID and password and then click the Reset Password button. A warning message will display, telling you that resetting the password will cause a new keychain file to be created. Your keychain holds frequently used passwords, so creating a new keychain usually means you'll have to resupply passwords for some services you use, including email accounts and some websites you've set up for automatic login. Click the OK button to reset the password. Enter the new password along with a password hint and click Reset Password. You'll be asked to restart when you are done. Apple includes a Recovery HD partition on newer Macs. It contains a Reset Password option. Restart the Mac while holding down the Command+R keyboard combination to enter the macOS Recovery partition. Release the keys when you see the Apple logo on the screen. Select Utilities > Terminal to open a Terminal window. Type resetpassword and press Return to open the Reset Password screen. Select I forgot my password from the available options. Enter the password for the account's Apple ID. Apple sends an authentication code to another Apple device registered to the same Apple ID. If you don't own another Apple device, you can opt to receive the code by phone or SMS text. Enter the code in the field provided. Enter the new password and, optionally, a password hint. Your administrator password has been reset. When you first log in after changing your administrator password, you are greeted with a dialog box telling you that the system wasn't able to unlock your login keychain. There are three ways to continue. If you happen to remember the old login password, you can click the Update Keychain Password button. It's unlikely that you'll suddenly remember the password, so you probably need to use one of the other two options. The second option is to create a new keychain that uses your new password. This option creates a nearly empty keychain file that is accessed using your new password. This option resets your keychain, so you'll need to supply passwords for various services, such as Mail and websites that require usernames and passwords. Click the Create New Keychain button. The last option is not to do anything with the keychain system. You can finish the login process by clicking the Continue Log In button, which takes you to the Desktop. This is a temporary solution; the next time you log in, you'll be presented with the same keychain dialog box. It may seem like a huge problem that your original login keychain is locked to the original password, and you find yourself forced to not only create a new keychain but also to resupply all those account IDs and passwords that you've built up over time with your Mac. Having the login keychain locked from access is a good security measure. You wouldn’t want someone to sit down at your Mac and use one of the methods outlined here to reset your administrator account. If resetting the administrator account also reset the keychain files, then anyone could gain access to the login information you use with many services, including banking, credit cards, investments, and all the other websites on which you have accounts. They could also start sending and receive messages using your email account or use Messages to impersonate you. It may seem like a major hassle to have to recreate all of your old login information, but it sure beats the alternative. One thing you can do is use a secure third-party password service as a place to store your login information for various services. This isn't a replacement for Mac’s keychain but a secure storehouse for you to keep the information safe, one which you can access using a different, and hopefully not forgotten, password. 1Password is good, but there are many others to choose from, including LastPass, Dashlane, and mSecure. If you want to find more password management options, open the Mac App Store and search for the word password. If any of the apps look interesting, check the manufacturer's website. Many times they include demos that aren't available from inside the Mac App Store. Can't Log Into Instagram? Missing Your Password? Learn How to Reset It Now.